~Peregrine Place~: ~Is she or isn't she? 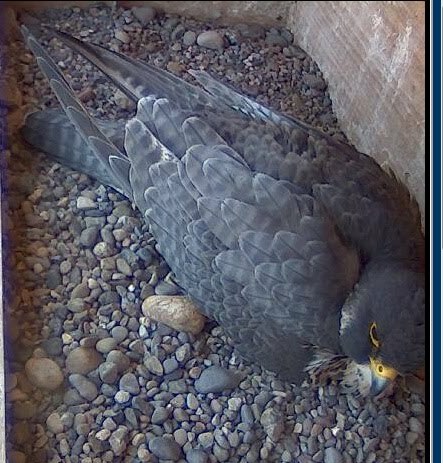 Is Stella incubating yet or not? 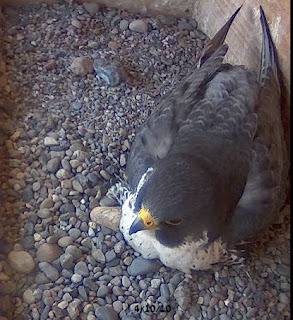 Connie checked the box Monday but there were no eggs. Today I got the first shot, below, from the parking lot and Roger got the second with his longer lens. Stella was patiently sitting and waiting, sometimes assuming "the position." Stash was high above on a lookout point. Then he took off, circled the tower a few times, before flying away. We waited, she waited. Eventually we went over to the sunny side of the tower to see if he had flown back undetected; then we returned to the nestbox side to find that Stella too was now gone. 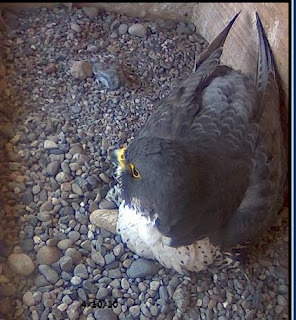 If a bird is sitting on eggs in the box, we cannot see it from our vantage point, so, was she inside incubating, or had she too flown the coop? Btw, it was very cold and extremely windy at Central Terminal today. CT is a high point in the area with no windbreaks to lessen the full force of the wind. The nestbox is placed on the protected side, so if we ever get any little pefas, they won't easily blow away. One of the fellas working at CT today said Stella has been ready and waiting all week, but Stash doesn't seem to be doing his part. Awwww, no! 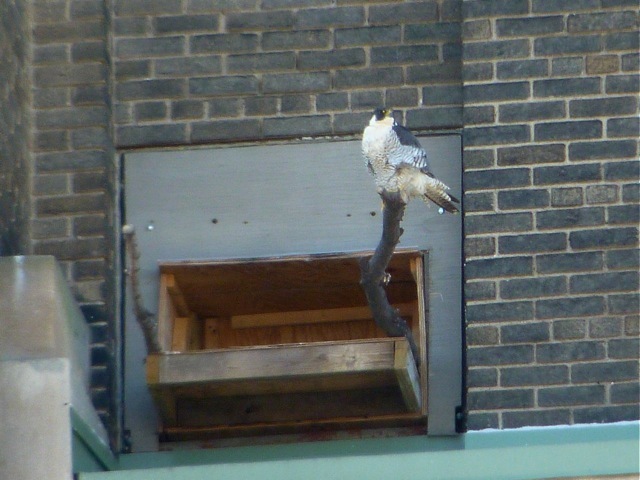 After last year, when she was a sub-adult, they were mating continuously and playing house big-time.